Teams are generally comprised of four players. 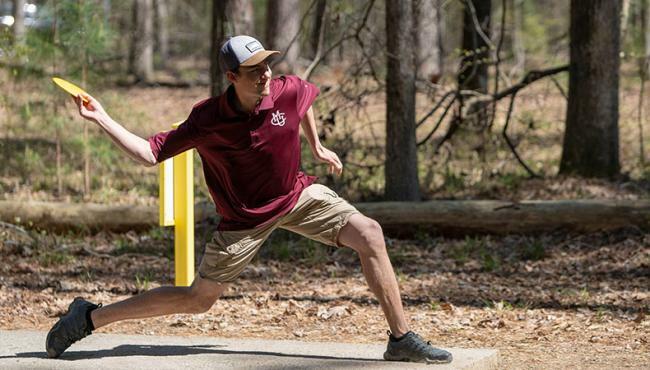 These are not the only formats allowed for play in collegiate disc golf. 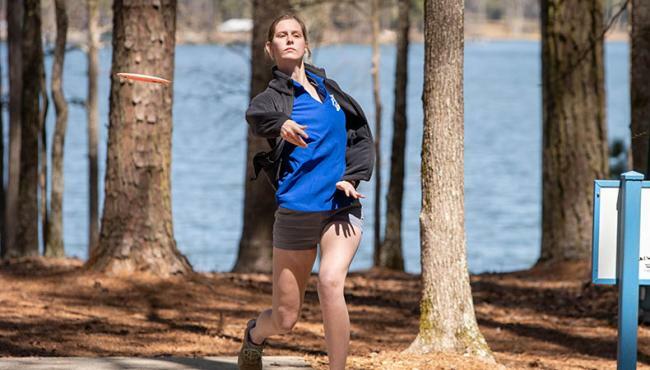 However, any other formats for NCDGC Qualifier events must be approved by College Disc Golf before the competition. 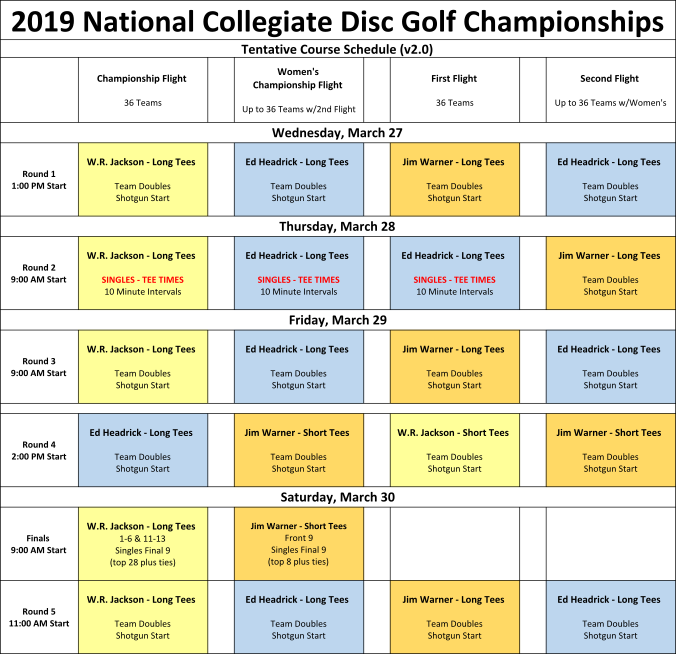 First Flight and the National Championship Flight, all singles rounds will count towards the cumulative team score. For Women's and Second Flight, the lowest 3 singles scores per round per team count towards the cumulative team score. Each hole should have no more than two teammates competing to prevent conflicts when making rules calls. Doubles is played with two sets of teammates, one ODD, one EVEN. The ODD set will tee off on every odd-numbered hole, while the EVEN set tees off on every even-numbered holes. After the tee shots, the team chooses which of the two lies to play. From there, the set that did not tee throws their two shots. Again, the whole team decides which lie to play from and the set that teed off would throw. That alternating process continues until the hole is complete. On the next hole, the corresponding set of teammates according to the hole number, ODD or EVEN, would tee off no matter which set putted out on the previous hole. This format allows for each player to tee off the same amount of times and for teams to play as whole. Each hole has two teams playing together as an eight-some. At the National Championships, we allow teams to substitute players between rounds if they wish. Teams are limited to using a maximum of 6 players. Those 6 players may be substituted as many times as the team desires. Any player who participates in the Championship Division will no longer be eligible to play in the First or Second Flight Championships. There shall be no substitutions during any round of play. Once a player is substituted out of individual play, by default, that player will not be eligible for any individual awards. 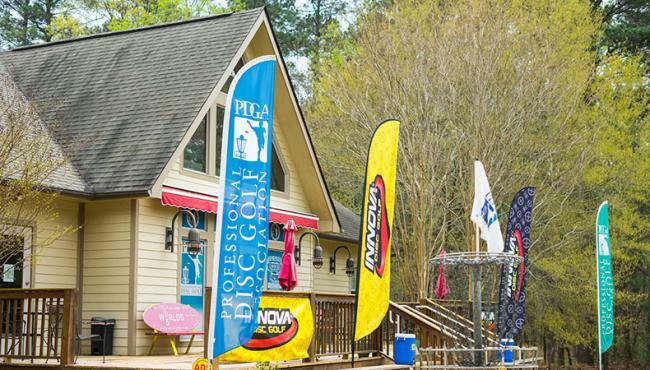 Visit NCDGC.com for more info.